4. 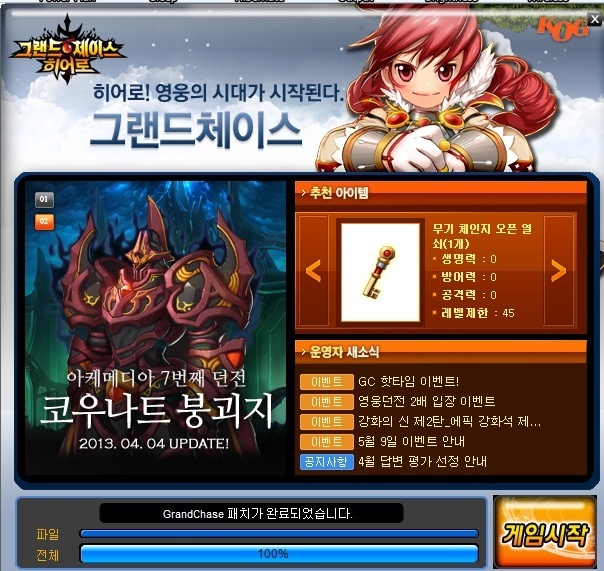 You'll end up at this screen, just click Game Start and allow the ActiveX controls to download and start Grand Chase. button is gold, turn on your proxy and press start. From there, just select a server, input your desired nickname on the character select screen, and play a game of Trial Forest to ensure the IP check has occurred. After that you won't need the proxy to connect again. It's also worth noting that there's a midnight ban that prevents you from logging in from 12AM in Seoul to 6 AM in Seoul. Attempting to log in then will just give you an error. thank you very much for this wonderful guide!!!!! how about when i plan to delete it? ill just go to control panel thats it? Is It Only For 30 Days ? 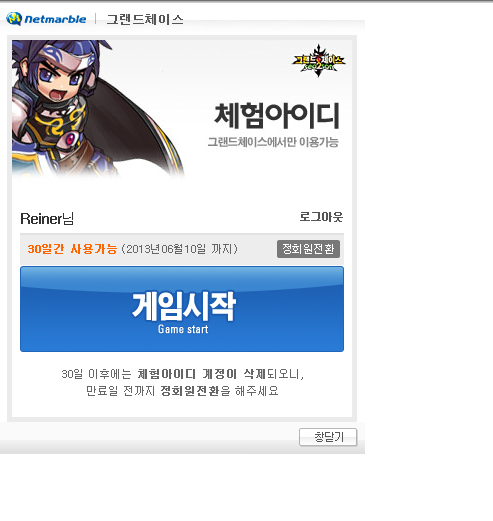 After that, are we able to play KGC again after the expiration date ? Roxis wrote: Is It Only For 30 Days ? but, on the other hand.. Yes, I'm sorry I wasn't clearer. It's only a 30 day trial. After that you won't be able to use that account to log in anymore. You can create a new trial account immediately though, and there's no limit to how many you can create. If you want to remove KGC from your computer, simply find "Netmarble Grand Chase" in your Control Panel's Programs and Features list. Nevertheless, there's still a way in :3 just enjoy the 30 days, I guess? lol Legend... I know what you mean though, the only other two guides about this on the web are outdated and involve going through Netmarble's site, and they actually removed the link to the trial there. That's why you copy paste the link in this one. I'm glad this is helpful to you guys though. It might be a good idea to wait for the start of specific events to make your account, like at the beginning of Ley's fourth job event I made mine, got a cash Ley mission and a cash Dark Origin mission. They did the same thing with Asin's second job I believe. Would it be possible to request a sticky? I think it'd be nice to have a current guide for this that everyone can see, right now it's pretty much our only way to play KGC anyway. I wasn't really sure when I made this. There's no dedicated forum category for help or guides after all. It's why I recommended proxifier. Download it from CNET (be mindful not to accept the adware during installation), install it, configure it with a South Korean IP Address (you can search for a list of those from a site like hidemyass.com), and turn it on at the moment I specified in the guide. Ill just notify this if the sticky request has been accepted.. It looks it didnt work i want you to make me one i'll give you info..
Star-Kun wrote: It looks it didnt work i want you to make me one i'll give you info.. I guess you could PM me the info, but if it's a browser issue you'll still have trouble with the next part. Or it could be a password issue, in which case it was too long or too short, it was all in one case with no numbers etc. Like I said it could be a lot of different things. You can just PM me here. Actually I sent you one, all you have to do is reply to it. I got stuck in the game start thing. What will I do?? I'm sorry but this topis is closed. Because Grand Chase is also closed.